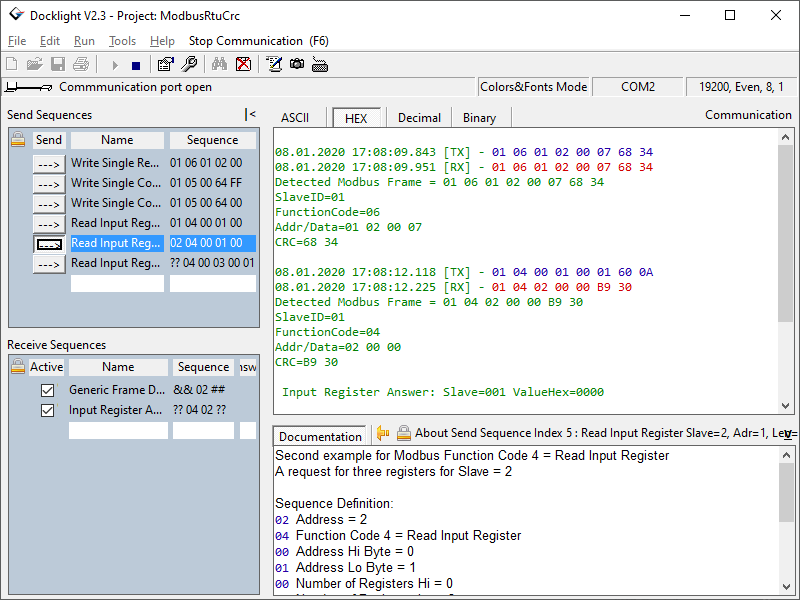 Simulating serial protocols - Docklight can send out user-defined sequences according to the protocol used and it can react to incoming sequences. This makes it possible to simulate the behavior of a serial communication device, which is particularly useful for generating test conditions that are hard to reproduce with the original device (e.g. problem conditions). Logging RS232 data - All serial communication data can be logged using two different file formats: use plain text format for fast logging and storing huge amounts of data. Or create a HTML file with styled text that lets you easily distinguish between incoming and outgoing data or additional information. 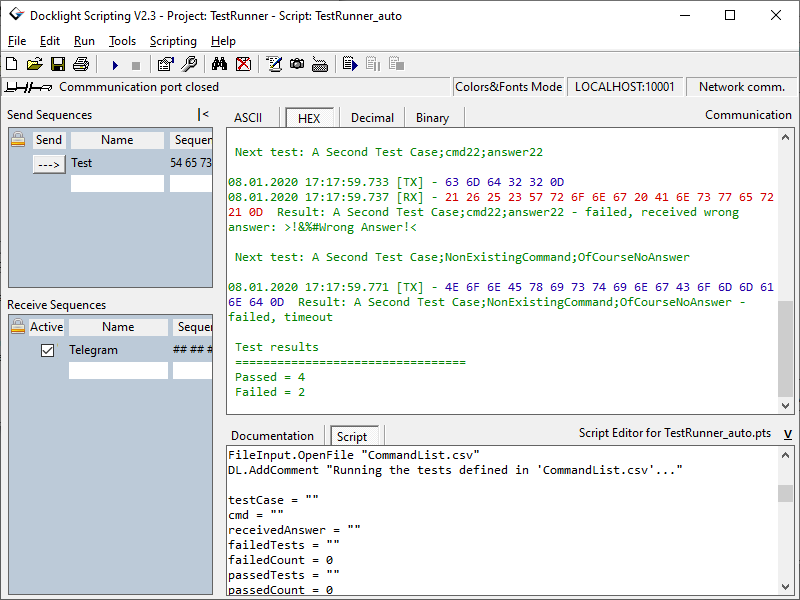 Detecting specific data sequences - In many test cases you will need to check for a specific sequence within the RS232 data that indicates a problem condition. Docklight manages a list of such data sequences for you and is able to perform user-defined actions after detecting a sequence, e.g. taking a snapshot of all communication data before and after the error message was received. Responding to incoming data - Docklight lets you specify user-defined answers to the different communication sequences received. This allows you to build a basic simulator for your serial device within a few minutes. It can also help you to trace a certain error by sending out a diagnostics command after receiving the error message. Docklight will work with the COM communication ports provided by your Windows operating system. Physically, these ports will be RS232 SUB D9 interfaces in many cases. However, it is also possible to use Docklight for other communication standards such as RS485 and RS422, which have a different electrical design to RS232 but follow the RS232 communication mechanism. Docklight has been successfully tested with a vast range of serial devices and drivers. This includes many popular USB-to-Serial converters, Bluetooth serial ports, GPS receivers, Virtual Null Modem drivers like com0com, Arduino serial ports, MicroPython/pyboard, and many other Embedded hardware devices that appear as a COM port in the Windows Device Manager. For the software and manuals please refer to the download section. You can find Application Notes and examples for different hardware interfaces and protocols in our examples section. A Docklight script allows you to execute all basic Docklight functions (sending predefined data sequences, detecting specific sequences within the incoming data stream, ...) and embed them in your own test code. Docklight Scripting is also network-enabled and supports HID or Named Pipe connections. Instead of using a serial COM port, Docklight Scripting can establish TCP connections (TCP client mode), accept a TCP connection on a local port (TCP server mode), act as a UDP peer, or access USB HID Custom Class devices. For an overview on networking applications, see our Docklight TCP/UDP and Applications, Examples sections. For the software and manuals please refer to the download section. communications monitoring (RS232, RS422 and RS485). and serial line events monitored. CTS, DSR, DCR, RI) and Break State. Real-time filtering - hide/show logged data by type or source, while the communication is running. 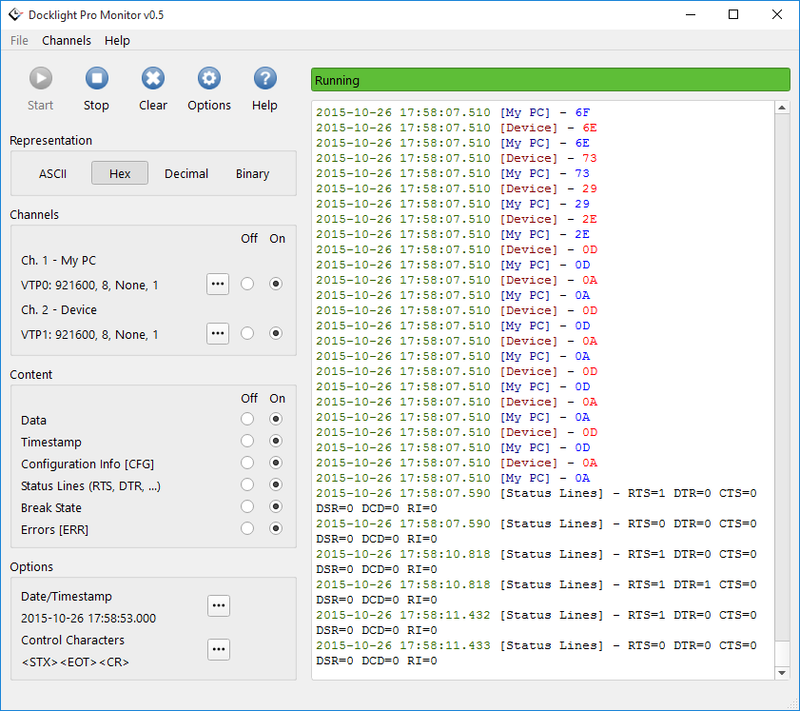 Docklight Pro Monitor is a free addition to Docklight Scripting. The Docklight DLL Automation API is a simple way to add Docklight-style communications (serial COM port, TCP or UDP, Send and Receive Sequences) to your Microsoft Excel workbook, Windows Script or Windows C#, C++, C or Java software application. The Docklight Application Note: DLL Automation API contains an overview on the functionality and examples for several languages and environments. An evaluation version is available for download. For licensing and pricing see our Docklight Order Information page. The Docklight software supports the Docklight Tap - the Docklight Communication Mode "Monitoring" offers fast and direct access to the two Docklight Tap data directions. This allows full duplex RS232 monitoring applications with much higher accuracy compared to standard USB-to-Serial accessories. Enclosed is a 1.8m Mini-B USB cable to connect the Docklight Tap to the PC. For technical data and dimensions see our Docklight Tap product sheet. For installation and use, see Application Note: Low Latency Monitoring with Docklight Tap. For software drivers and additional documentation please refer to the download section. 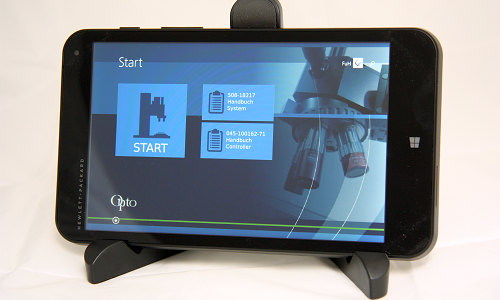 Own hardware time base with internal accuracy 1µs, available Docklight display resolution 1ms. RS232 status line monitoring (RTS/DTR/CTS/DSR/DCD/RI) in correct chronological order, along with the actual communication data. Supports baud rates up to 921600 bps. Supports 3.3V/5V TTL and RS232 voltage levels. Connectors and cables are the same as for the Docklight Tap. For technical data and dimensions see our Docklight Tap Pro product sheet. For installation and use, see Application Note: Docklight Tap Pro and Docklight Tap 485 Support. Please note: The Docklight Tap Pro is only available within the EU/Switzerland/Norway currently. If you are interested in purchasing a Docklight Tap Pro from outside the EU, please contact our support at docklight@fuh-edv.de. 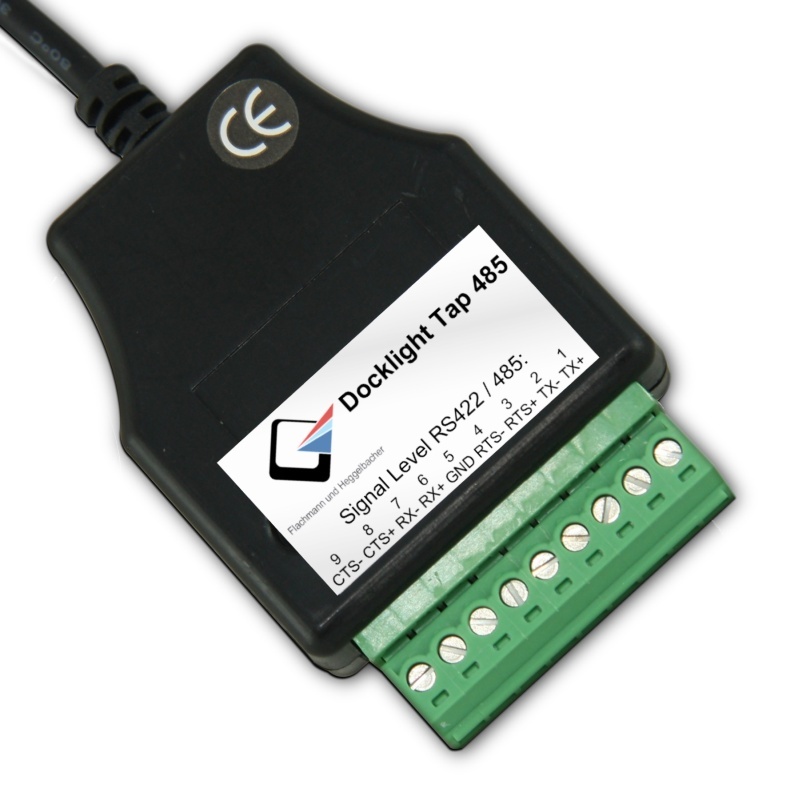 Docklight Tap 485 is the universal solution for high accuracy RS485, RS422 and RS232 monitoring in Docklight or Docklight Scripting. High speed baud rates up to 921600 bps. USB Type A 1.8m cable to connect the Docklight Tap 485 to your PC. Screw-terminal connector (Phoenix Contact MC 1,5/ 9-ST-3,81) for flexible RS485, RS422 and RS232 wiring. For detailed technical data and dimensions see our Docklight Tap 485 product sheet. 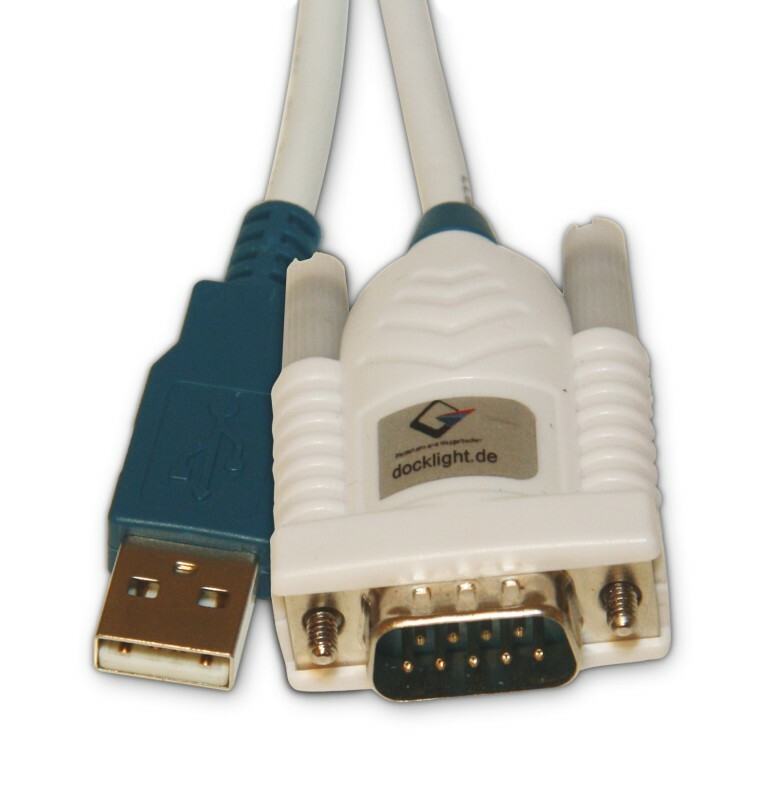 The Docklight RS232 Adapter is capable of communication rates from 300 Baud to 1 MBaud. It adds one RS232 / serial COM port by connecting to the USB. The industry standard FTDI chipset and device drivers are supported by Windows Update and ensure maximum compatibility. 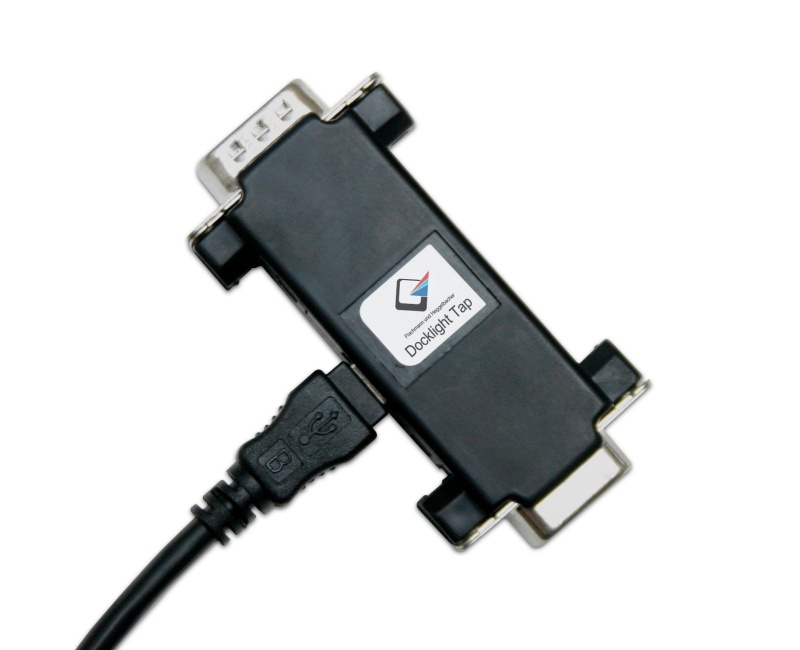 For detailed technical data and dimensions see our Docklight RS232 Adapter product sheet. 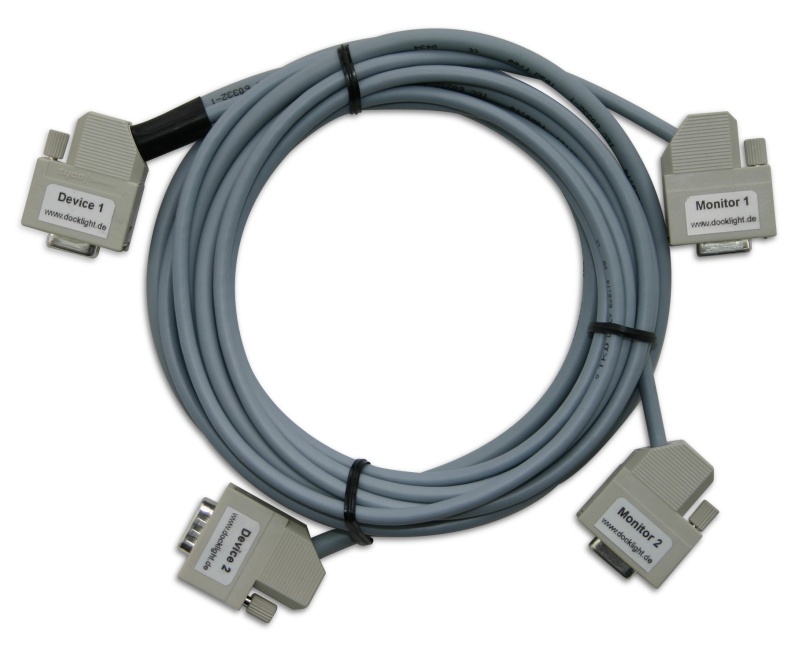 For installation and use, see Application Note: Docklight RS232 Adapter. Please note: The Docklight RS232 adapter is only available within the EU/Switzerland/Norway currently. Docklight Monitoring Cable is a custom RS232 cable designed for the use with Docklight Monitoring Mode (full duplex monitoring). The cable follows the cable specification of the Docklight User Manual. The Docklight Monitoring Cable has shielded ends and is an electrically and mechanically rugged solution for industrial applications. Please note - Only in very specialized or legacy applications the Docklight Monitoring Cable is still the preferred choice today. Our Docklight Tap, Tap Pro or Tap 485 data taps offer superior monitoring characteristics, and do not require two free RS232 COM ports on your PC. For technical data and dimensions please see our Docklight Monitoring Cable data sheet. Please note: The Docklight Monitoring Cable is only available within the EU/Switzerland/Norway currently. Please see our FAQ section on alternative solutions.